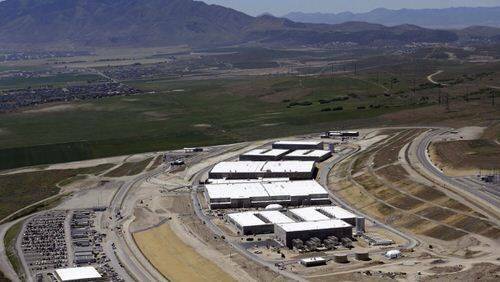 The NSA's new Utah Data Center, codenamed Bumblehive, under construction. Another day, another discovery from the leaked Snowden documents that the U.S. National Security Agency has their hands in yet another privacy cookie jar. If the government weren’t shut down, we could start asking the NSA to pay at least some of our Internet bills, given how intrusive the intelligence agency seems to be. Today’s news, this time from the folks at the Washington Post: the NSA is collecting email contact lists and instant messaging buddy lists from “hundreds of millions” of accounts globally, including accounts that belong to U.S. citizens. This, despite assurances from the Obama administration that Americans would not be involved in such online intelligence gathering. The Post, which obtained the information from the seemingly endless treasure trove of data leaked by former NSA contractor Edward Snowden, outlined the NSA practice of collecting the contact lists in order to establish connections and relationships of the targets of their investigations. While the program, which is separate from the collection of phone records to obtain similar connections, does not target Americans specifically, the Post’s sources confirmed that U.S. citizens are getting swept in the collection process. The continuing flow of leaked information from the Snowden documents could drive terrorist and criminal organizations to ground, as nearly any communication method they could possibly use seems to be infiltrated by the NSA. This will be at once good and bad—bad because the NSA will have to find new ways to get their electronic intelligence and good because at this rate, the only thing criminal groups will have left with which to communicate will be telegraph machines. Even though the evidence cited by the Post highlights information gathered from Microsoft, Facebook and Google (among others), spokespeople from all three companies disavowed knowledge of or participation in such a program. Yahoo, also named in the documents, said that it would start encrypting all e-mail communications starting in January 2014.